Good. This kit offers everything needed to whip up beautiful and practical creations. 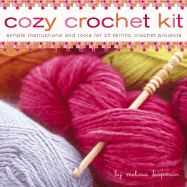 Includes a fully illustrated, 32-page book with all the basic crochet techniques, 25 simple patterns, five crochet hooks, yarn needle, lifting ribbon, and yarn.